Ultragreen Plus 20% RCA uses by-products from other manufacturing industry such as fly ash and slag, at a 70% cement replacement. This reduces the overall environmental impact of these industry waste by-products and reduces the overall carbon footprint of the concrete. Lafarge utilizes Portland Limestone Cement, which results in a 10% reduction in carbon dioxide emissions as compared to regular portland general use cement. To minimize our impact on water resources, Lafarge reduces the amount of fresh water consumption by incorporating a percentage of reclaimed water to the concrete. Regular quality control testing ensures there is no impact to the concretes fresh and hardened properties. In some Lafarge locations Ultragreen Plus products 30MPa and below contain 20% recycled aggregate, produced from Lafarge’s internal returned concrete and is manufactured right at the plant. This reduces our consumption of natural aggregates and reduces our carbon footprint by eliminating a percentage of the transportation of natural aggregates from source manufacturing gravel pits. Regular quality control testing ensures there is no impact to the concretes fresh and hardened properties. 2.1.8 Deck or veranda surfaces (1 point) and/or structure (1 point) made from a third-party certified concrete (i.e. 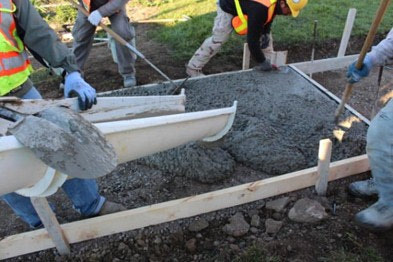 concrete from a source having a third-party certified reclamation plan), or from concrete containing a minimum of 25% supplementary cementitious materials. 2.2.4 Concrete used in home has a minimum supplementary cementing material of 25% (1 point) or 40% (2 points) within the scope of proper engineering practices.